It’s not an either/or proposition – industry and the environment can and do co-exist. 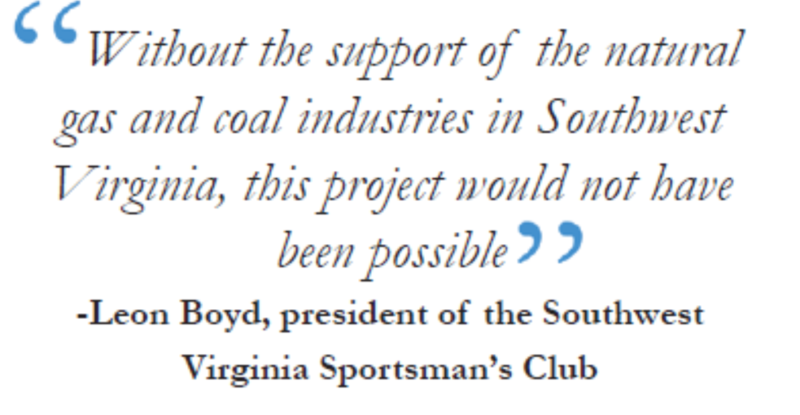 That’s the message Leon Boyd, a member of the Virginia Department of Game and Inland Fisheries; chairman of the Southwest Virginia Coalfields Chapter of the Rocky Mountain Elk Foundation; and president of the Southwest Virginia Sportsman’s Club wants to be certain that anyone looking at the natural gas industry in Virginia understands. And, nowhere, he says, is it better illustrated than in Buchanan County – Virginia’s largest natural gas producing county. It is in Buchanan County where the work the natural gas and coal industries have put forth in reclamation that an elk population reintroduced to the region after a 100-year absence is thriving. The first elk were released into the habitat area in 2012 and two subsequent releases in 2013 and 2014 followed to bring the release number to 71 over three years. At last count, those elk have now multiplied and the herd is now estimated at close to 200. The reason? According to Boyd, it’s the work the industry has done in reclamation. Careful and considered planting of the right seed mixes has provided the prime environment not only for the elk to thrive, but for other species to thrive as well. The county has a healthy population of deer, bear and birds in the habitat restoration area, Boyd says. And he should know, because in addition to the state and volunteer groups on which he serves, Boyd also works for a local drilling company and sees firsthand the benefits of the work the industry has done on this project in his day-to-day visits to the field. He also volunteers his time, as do other sportsmen through cooperative agreements with two tourism venues in the region to lead tour groups to view the elk. The project to reintroduce the elk to Buchanan County began in 2010 when the gas industry came together with the Rocky Mountain Elk Foundation, DGIF and others to make it possible. Some $250,000 in money and materials for the project came from natural gas industry producers and other related companies operating in the region, who provided the monetary support to start the project which is situated on 1,500 acres of coal and gas lands. Through cooperative agreements with the companies and some private landowners, the elk were brought back to Virginia and now thrive in part through the continued work of the industry and its partnerships with DGIF, RMEF, and the sportsmen’s club in creating habitat feeding plots in the areas in which the elk are located.